Dad loved historical markers. He would stop the car when we were little and have us read the markers by the side of the road. It was as much the teacher in him as the parent in him. By the time we were old enough to know better it drove us nuts that he did that. So then the joker in him stopped to let us know he was still in charge. I was once really angry with my dad. He looked at me and smiled and then said “look up.” I looked up. Then he said “look down.” So I did. Finally he said look all around.” So I did. He smiled and said “that’s my house. When its your house you make the rules.” I use that on my kids all the time. It’s a great way to calm them down when they are angry and remind them both that there are rules in this house and that someday they will have their own houses. 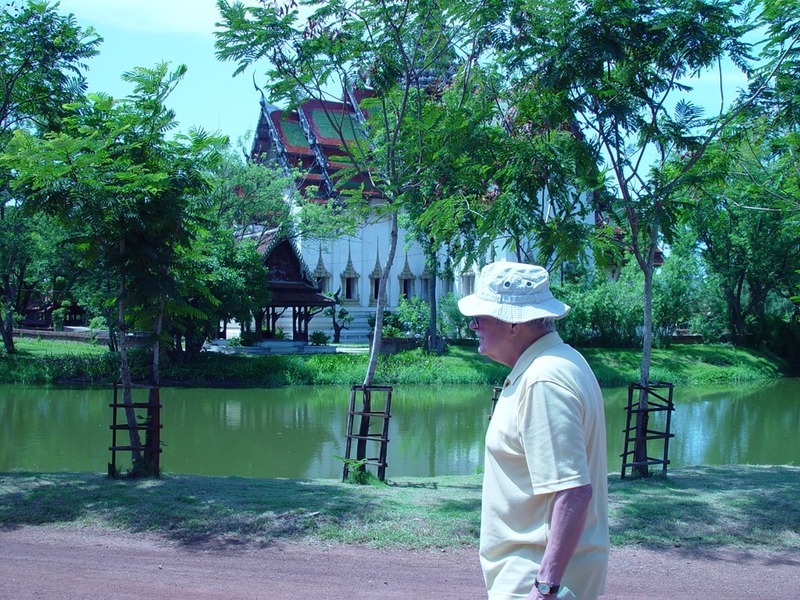 My father in the old city of Bangkok Thailand circa 2004. He loved Thailand and its wonderful people. We all do. But he came alive in a special way there. Here he was walking around the old town with us showing the boys the sites. After a 24 hour trip in an airplane Barb and I were fried. We didn’t sleep. The boys of course slept on the plane and adjusted to the new time zone in one day. Like their grandpa they were up and running in Thailand. The thing about my mother that always makes me proud is her willingness to be inclusive. When I got married the 2nd time (and after mom and dad had well saved me from sliding into depression) my wife-to-be had a daughter. My parents took her in as their first grandchild and to this day she remains their first and oldest grandchild. They have always treated her like all the other grandkids. That takes special people and both of them are special people. The other thing about my mother is she is fair. When you make a mistake she will tell you. She doesn’t hold it against you but she will tell you. Sometimes she will tell you many more times than we want to. It helps make the lesson learned stick a little better I suppose. Thanks mom for making some of those lesson’s that I needed to have, stick! 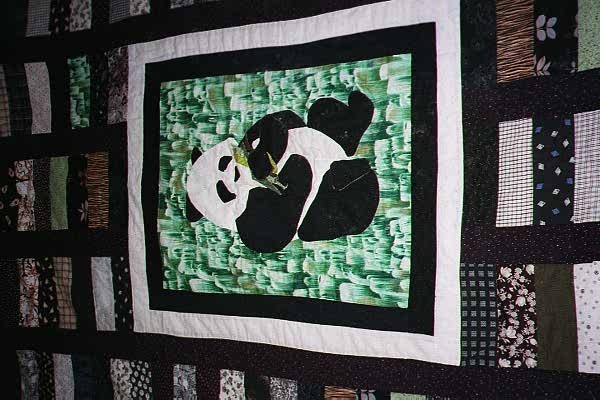 The first picture is of one of the kids favorite quilts. 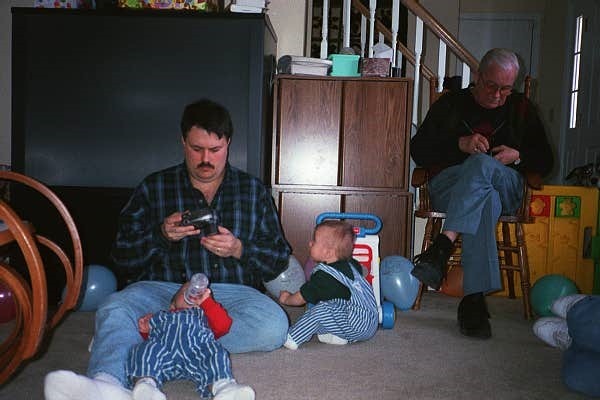 The second picture is both dad and I adjusting our camera’s at the boys first birthday party. It seems like just yesterday we were in the hospital and mom and dad were driving over from Bloomington to Cincinnati to see them. It was in fact an event that happened 15 years ago. I didn’t know my Grandfather Andersen very well. I have a couple of things of his that dad left me, including a picture of him with his Infantry Unit in World War I. I also have his pocket watch and my great grandfathers pocket watch. I remember visiting a house that seemed huge then but wasn’t in Wisconsin Dells and also visiting them in a smaller house in Racine Wisconsin. I remember the house in Racine because the Bulls Game was on. I do have the copper kettle that entered our family in 1863 as well. Dad really didn’t talk much about the past. He didn’t like dwelling where he had been. On to other memories. We used to play Uno as a family. You had to watch dad not only because his constant claims of color blindness would allow him to attempt to play any color at any time (color green, number 2 dad plays a red 5 “I am colorblind.”). It made the game more interesting. Dad wouldn’t play card games very often but when he did we always had a lot of fun. Both mom and dad loved to watch movies. Ranging from light romantic comedies to some of the more classic films of the past. The arrival of the VCR allowed them to watch many more movies than previously. Originally we had 5 TV stations to choose from and with cable we went up to a grand total of 12 stations to watch. There was always a movie on, as long as you were willing to watch that movie. With a VCR mom and dad could watch any movie they wanted. Of the two I suspect my mother is bigger movie fan. My favorite memory of movies with mom was going to the original Pink Panther movies (although Steve Martin did a good job in the remake, it wasn’t Peter Sellers). Mom and I would go to the theater and laugh for the 100 minutes of the movie. Mom would also take me to some of her and Miss Hart’s favorite movies (Agatha Christie was a common favorite). The three of us went to see Murder on the Orient Express. That we didn’t laugh through but it was a memorable event. A stitched photo of dad and part of his book collection circa 2006. As you get older you find your memories are wound around the strangest things. In the case of my father it’s the moon landing of 1969, Thailand in 1972 and sitting in his office as a college student 1982-1984 and watching IU ball games (any year) with dad. I have many other memories of both mom and dad but those four are the ones that I wind all the others around. In the winter we would start every conversation with a brief recap of the last game the IU team played. Dad had a brilliant eye for basketball played well. He knew when the team had come together and was ready and when they were struggling. Last winter we talked frequently about the maturity of the team and how they just weren’t ready. But dad was also a loyal IU fan. He loved the candy stripe uniforms. Mom enjoyed the games although not as much as dad. I think in the end she just liked hanging out with dad during the games. We had season tickets and I went roughly every other home game. Mom would go to the other games. I remember sitting next to dad during the two greatest sports seasons of my life. The undefeated regular season of 1975 only to lose to Kentucky in the NCAA tournament and the perfect 32-0 1976 Indiana Hoosiers. No one can take 1976 away from us. 32-0. Dad took me to 8 or so home games that year. We sat high up in the professor section. We watched a magical team below us in a magical building. Yes 1981 was a great team as was 1987 but that 75/76 team that was the team dad and I rooted for. I learned a lot about basketball that year. What a team really was. I watched my father’s heart skip a bet until Kent Benson tipped the missed shot in against Michigan as time expired. He didn’t catch the ball he tipped it. Had he caught it the game would have been over. A moment in time dad and I watching as the tipped ball bounced into the basket and we beat Michigan by 1 point. Mom wasn’t the sports fanatic dad was and taught me to become. Mom was creative. I watched her take a piece of fabric and turn it into a quilt. Quilts that my children won’t sleep without. She has over the years had each of the kids make part of a quilt so that they were involved in the process that resulted. I know that my nieces, nephews and my kids all love working on quilts with grandma. The boys would never admit it now they are too cool but they did and do love quilting with grandma! Dad bought me my first beer at 21 years old at the Noble Romans on 3rd street on the West side of Bloomington. We had a beer and breadsticks and sat and talked for an hour or so. I carried on that tradition with Jaki and bought her first beer at Dogfish Grill in Gaithersburg Maryland. Life was different when I entered college and I struggled for my first couple of years. Part of me did not want to be like my father and become a teacher. I wanted to be my own person. Dad never pushed me to be anything other than what I wanted to be. In my second full year of college I switched to the school of education and started eating lunch in dad’s office. I don’t know why it meant so much to me to eat lunch in his office. It still means a lot to me all these years later as did that first beer. I guess it meant that connection that I pushed on and pulled on was still there. It gave me a sense of connection and it still does. That my father and I had and have a bond that is greater than simply biological. In the end we all seek connections to our parents. To understand what and why they did what they did and became who they were. My mother’s father, my grandpa Ray was a great influence in my life. When I wasn’t getting along with my parents I could always talk to my grandfather. He always took their side when it came to the fairness of the work assigned but he listened to me. I realized later in life that both mom and dad listened to me as well, I just couldn’t hear them over the din of my own frustrations. The most symbolic beer I shared with dad was a Singha in Bangkok Thailand in 2003. Mom and dad were staying in Thailand and mom/dad wanted the grandkids to see the place we had once lived in. Dad and I shared that beer at IPST the place that was built by Dad, Miss Hart and other members of the project from UNESCO all those years before (32 years before at that point). I was too young for beer the first time I was in Thailand. Now I could and it meant the world to me, it still means the world to me. To just sit and share a moment with dad. It is natural in childhood to separate from your parents. Mom and I did just like dad and I did. With mom I always shared a love of cooking. So now I faithfully reproduce many of mom’s dishes. I learned to cook from my mom and dad. My dad was a by the numbers measurement kind of cook. My mother had a flair for flavors. Its really hard to recreate her recipes because there isn’t one. I remember the first time I cooked for my mother-in-law Joan Ralstin. She was horrified that I wasn’t measuring spices. She told me afterwards that she was dreading a very awkward meal (horrible food and an awkward silence) but instead she loved what I made. I was allowed to cook for her after that every time she came to our house or we went to their house. Parents, Grandparents, in-laws, Aunts and Uncles all make us who we are. I was blessed with some incredibly awesome role models in every single case. People have seasons and dad’s was summer. He loved harvesting his garden (and tending his garden). 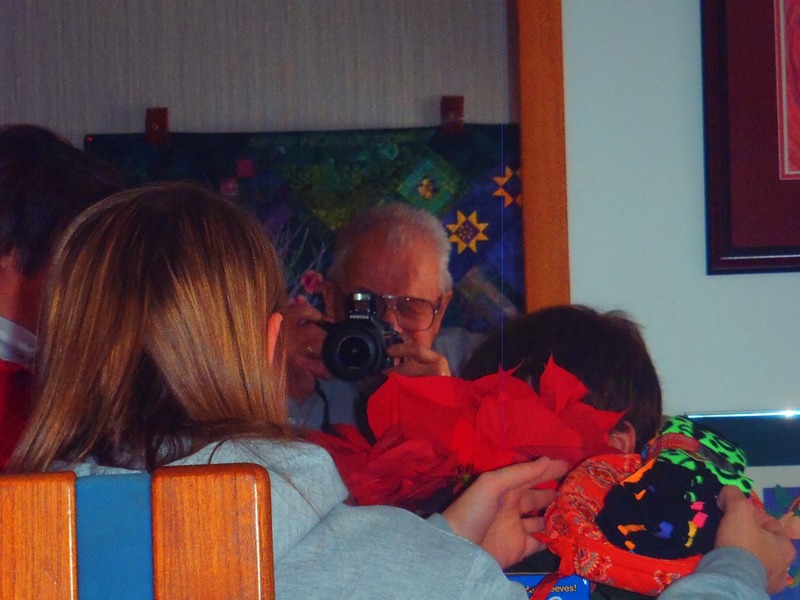 He explored many different ways to plant the things he loved (and my mom loved). He played with raised beds and a number of other gardening innovations from around the world. He grew asparagus that was amazing as well as previously stated the best tomatoes. Summer events were on the back deck at Mom and Dad’s house as the kids got older. Before dad planted the bamboo in the back yard there was a swing set that the kids loved to play on. The grills would be going and the coolers would be filled with drinks. Dad would be grilling and talking to everyone as he was in this picture. 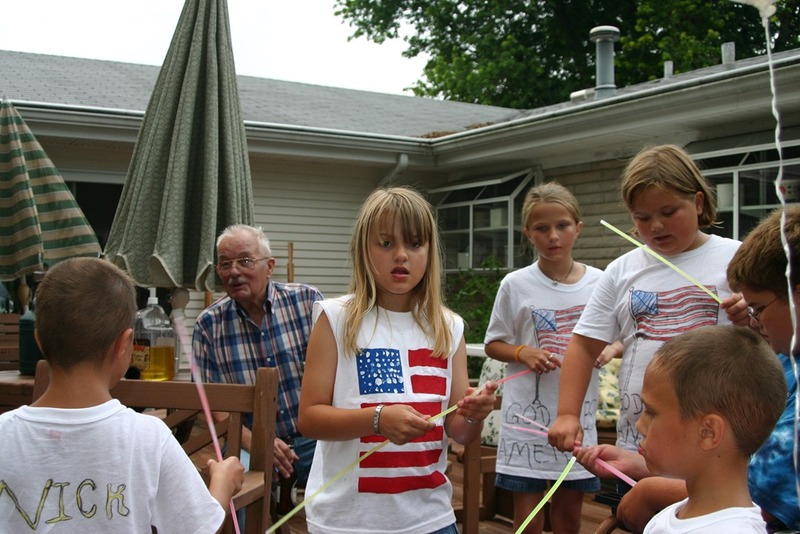 Later on this particular fourth of July we had sparklers and then everyone wandered home. That’s the thing mom and dad both did as we got older (by we I mean myself, my two sisters remain young and vibrant). They made their house into a place people wanted to come and sit. The major holidays were always there. For years mom and dad did an Easter egg hunt on their front lawn for the grandkids. Plastic eggs all over the front yard that mom would mow over for weeks afterwards shooting tiny bits of plastic across the yard. We finally had to implement a count (45 eggs put out 45 eggs recovered). Dad liked to put state quarters and Susan b Anthony dollar coins in some of the eggs. It was just something he loved to do. Dad loved to take pictures he didn’t like to be in pictures. This is from Christmas morning 2010 (our last Christmas living in Indiana). I swung around to catch him unaware but he popped his camera up before I could get the picture. So even though this is two years earlier dad is in the exact same spot. This is Easter 2009. My father was the family photog from 1960 to 2000 or so. 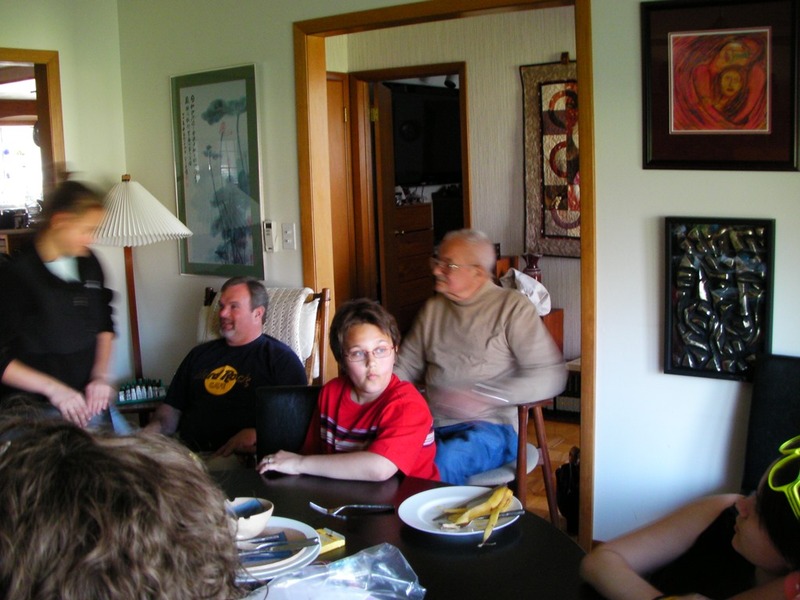 With the advent of digital pictures I started taking family event pictures in roughly 2005. This is one of dad’s old scanned slides. I don’t know where or when this slide is from. 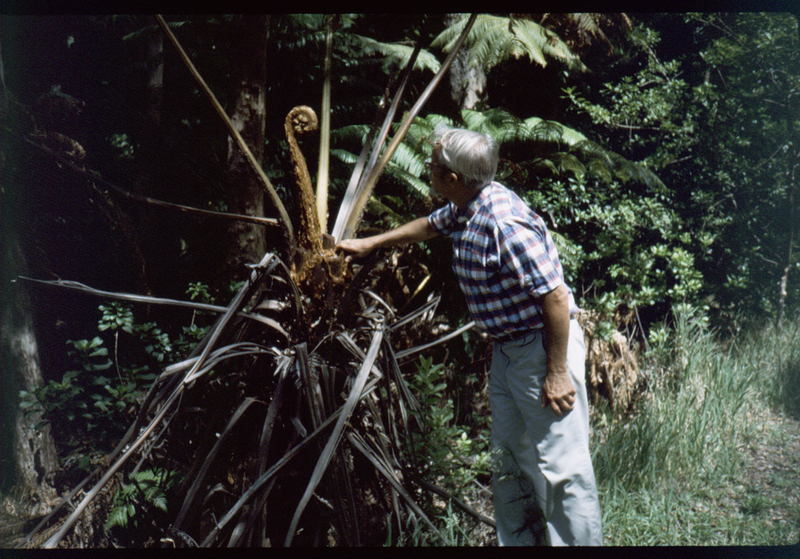 Its dad looking into the maw of a man eating plant I suspect, although I do know this slide is more than 30 years old so in fact the plant did not eat him. This picture is important because he was not in the same spot as the other two. As we sort and scan the thousands of slides from my great grandfather and father I will post them on occasion. Right now I have to figure out how to get them scanned. This one is of the Ajhan. From the party we had in 2006 at the graduation of one of his sponsored Thai students (Nat). 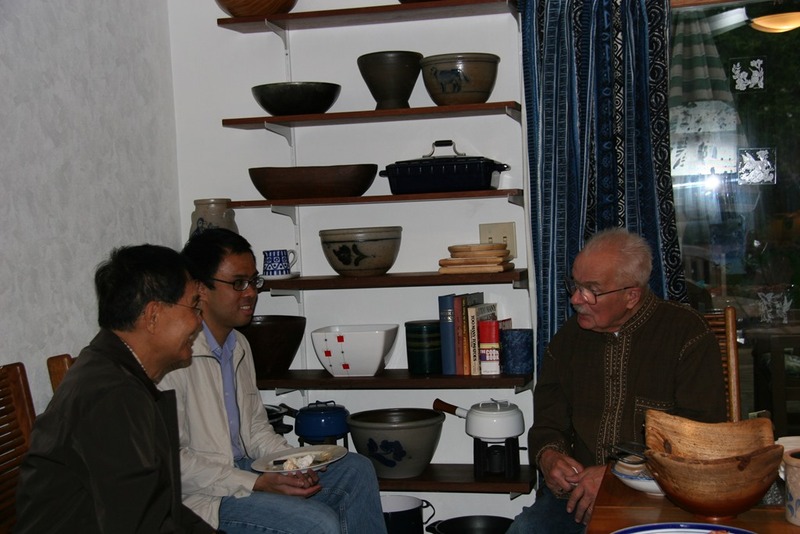 Dad was so animated as the Ajhan it is hard to imagine him ever actually sitting down. My dad loved Old Towne Canoes. We drove up to Indianapolis to the Galleons’ second hand store to look at a couple of canoes. We ended up buying two 17 foot canoes. One had a cut out at the end so you could attach a motor but dad was a purist and we never added the motor. As boy scouts we used those canoes all the time. Over the years dad found many wonderful walks (I now realize they were wonderful not so much then). One time we walked from through the woods around Griffey Lake (actually the first water supply for the town of Bloomington Indiana). We had Phoebe with us and of course she loved water so she was in the muddy water of the small lake we found about a 1/2 mile North of Griffey. It took Lynne and I an hour to get her clean when we got home. Then we were informed that we also had to clean out the car. That took another hour. I suspect there is a life lesson in there somewhere. I still haven’t found it. But we got her clean. We got the car clean (on the 3rd or 4th attempt. When dad went into inspector general mode it was hard to get anything clean to his specification). Later in life dad had hearing aids. It changed his approach to parties and gatherings. When I was young you would find my father in the middle of the discussion. Later because of the hearing aides he would move to the sides of the party so as not to get blasted with all the noise. Dad was a consummate story teller at parties. He could regale you with wonderful stories from his past (or from his families past). It was wonderful to sit and listen to him talk. Given the chance of course dad would take the conversation off track with a pun or wry comment. Mom on the other hand tended more towards subtle humor. She could, like a great prize fighter, land the one punch that ended the fight on occasion but her primary weapon was the use of subtly in humor. She also loved to use colorful names for people. As a child I was always amazed at the colorful (not rude) names my grandfather used to address other drivers. Cement Head, bubble brain were a few of them. Mom would do the same thing. At some point along the way she picked up the phrase “Turkey Buzzard.” Depending on the tone in her voice when the TB was uttered you knew if you were in trouble, or had simply made her stop and think. The first one meant move away quickly, the second one meant you had entertained her but not enough to make mom laugh.